1949 Diamond T 306 Van from "Two-Lane Blacktop"
Desert Classics...1949 Diamond T 306 Hippy Van from "Two-Lane Blacktop"
This is the 1949 Diamond T Model 306 ice van truck that appeared in the 1971 cult drag-racing movie Two-Lane Blacktop by acclaimed director Monte Hellman. 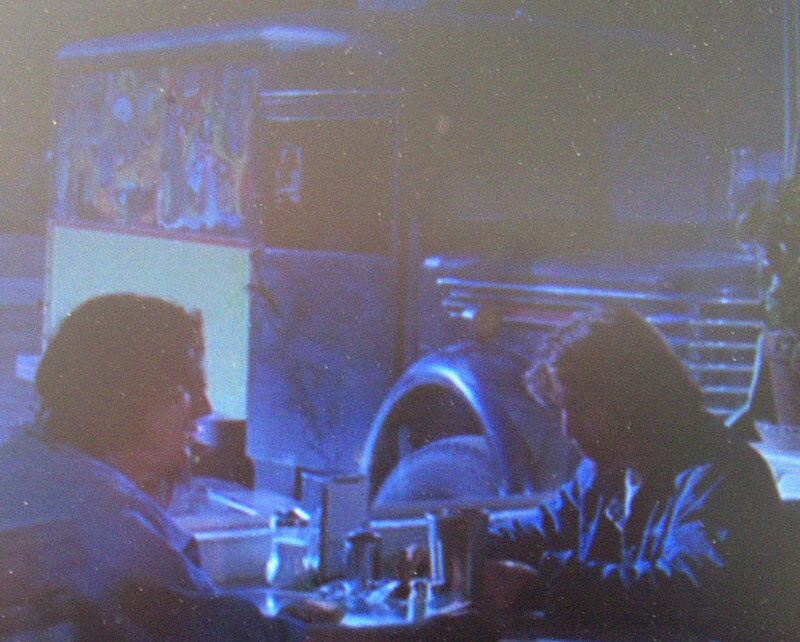 The film revolves around two guys... "The Driver" (played by James Taylor) and "The Mechanic" (played by Dennis Wilson of the Beach Boys), who drift across the USA on Route 66 in a hopped-up 55 Chevy, earning money along the way by challenging locals in each town to street drag races. The pair pick up "The Girl" (a hippy chick hitchhiker played by Laurie Bird) in Arizona. In New Mexico, they race "The Driver" across the USA for "pinks". 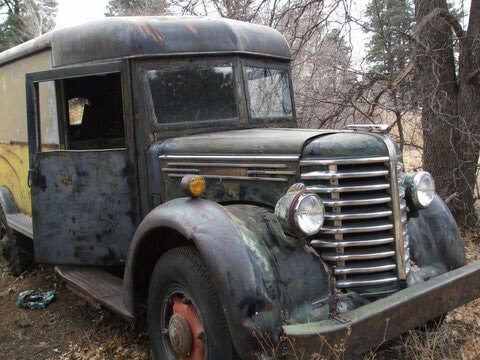 This is the funky truck that dropped "The Girl" off in Arizona. The van is owned by my client, who was part of the movie production crew. He bought the truck in Arizona, where it was an operating ice van. In preparation for the movie, the mechanicals were overhauled. My client did the original artwork on both sides of the truck. 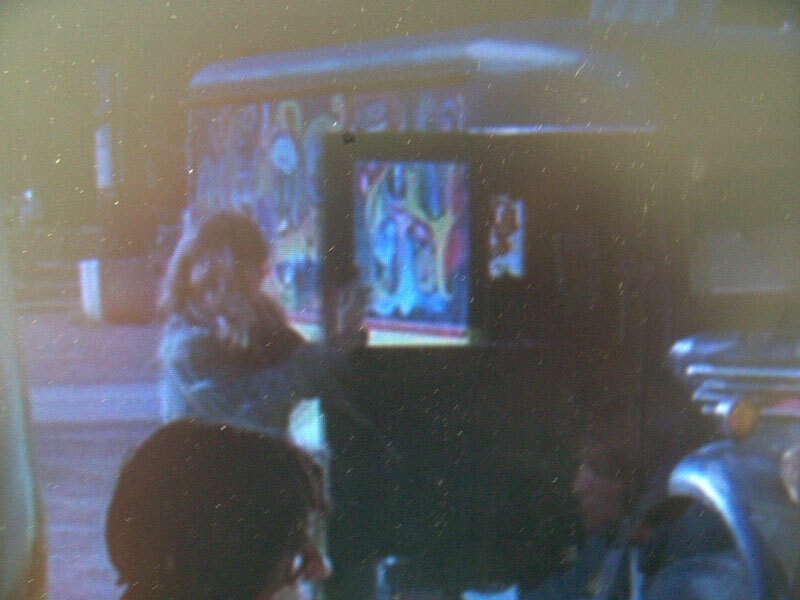 He also drove the hippy van in the movie. The panel side that was shown in the movie is a very colorful physcodelic colage painting, which has mostly faded away. The other side features a chick on a Harley with the banners reading "Cannibus Dist." with "Rosemary's Baby" on the back. It also had lettering that said "Don't laugh, your daughter may be in here" but they have faded away. After the movie was made, the owner logged about 3,000 miles on this movie-prop hippy van, using it as a camper. It was then retired to his back yard. It has been sitting for about 30 years in the dry southwestern USA desert. 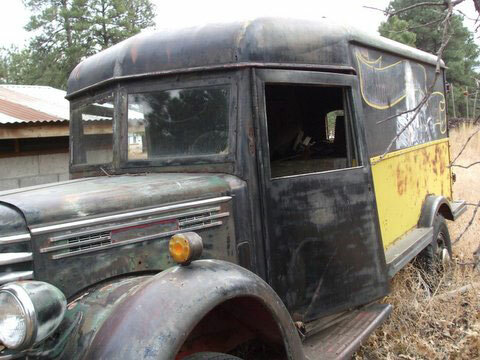 This one-of-a-kind cult movie prop truck is a true time capsule find. The body is in good shape and solid. There is a repairable dent in the right front fender. The grill is nice. This truck could be used as-is in a museum or used as a commercial prop for advertising or marketing... or a must for any private collector who grooved on that early 70's street racing scene. 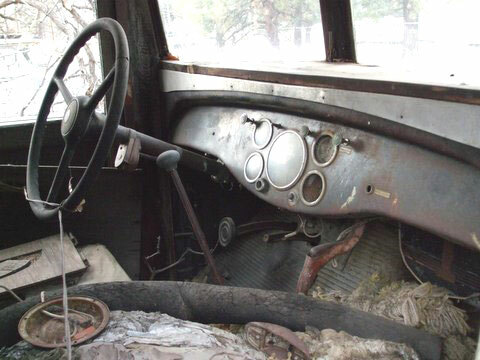 The truck could also be restored. 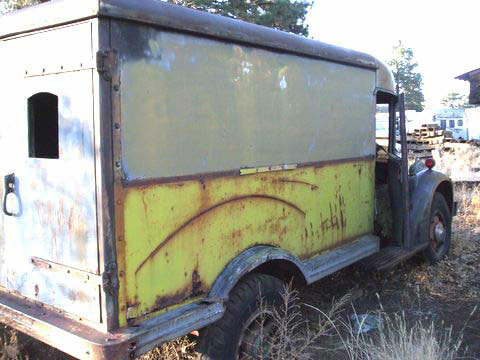 If restored, the artist is available to be commissioned to redo the van artwork for $5,000. 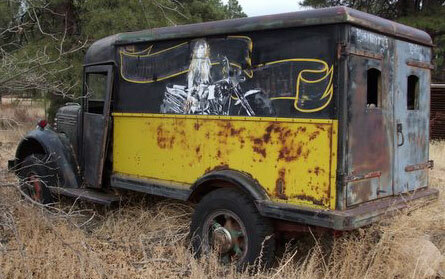 Don't miss this truly unique one-of-a-kind movie prop truck from the now wildly-popular cult drag racing film Two-Lane Blacktop. Please contact (406) 318-0270 for details about this rare find. For sale $25,000. "Don't laugh, your daughter might be in here"
Click on the image below to compare the faded right side artwork to the images taken from the movie. The best identifaction area is the guy with the sunglasses in the lower left corner.